GREEN turtles are swallowing plastic at twice the rate they did 25 years ago, according to a new study. The finding is based on data collected across the globe since the late 1980s and analysed by researchers at the University of Queensland. Study leader and PhD candidate Qamar Schuyler says green and leatherback turtles are eating more plastic than ever before and more than any other form of debris. 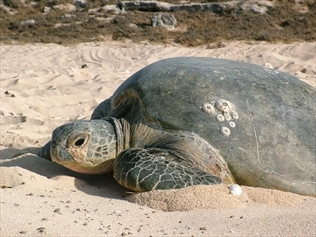 The ages of turtles and their habitats are also factors. “Our research revealed that young ocean-going turtles were more likely to eat plastic than their older, coastal-dwelling relatives,” Ms Schuyler said on Friday. Amazingly, stranded turtles found adjacent to heavily populated New York City showed little or no evidence of debris ingestion. But all stranded turtles found near an undeveloped area of southern Brazil had eaten debris, Ms Schuyler said. Students have saved up to 15,833 plastic water bottles from going to landfill this semester. But they haven’t been going thirsty. 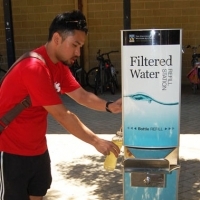 In February the Sustainable Development Office installed a filtered water refill station in the Guild courtyard. The refill station is the first of several that Recycling and Waste Management Coordinator, Alain Twynham, aims to have installed across campus to help decrease the number of plastic bottles that make their way into landfill. Alain said 9,500 litres of water had been used from the refill station. “That’s equivalent to 15,833 600ml bottles,” he said. The free refill station promotes a healthier lifestyle for students and staff. 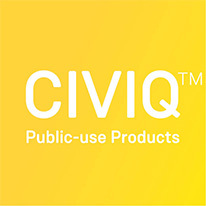 It is connected to the mains water supply, and filters out chlorine and other chemicals. There has been immense support and positive feedback, especially from students. 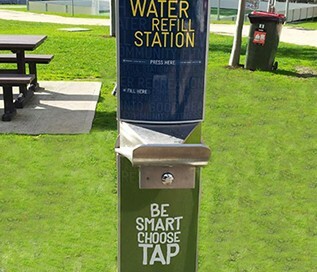 “The water station is very popular and will hopefully permanently reduce the number of plastic bottles from UWA that end up in landfill,” said Trish Howard from Sustainability Projects. The Student Guild was supportive of the refill station’s installation in the village and its associated environmental and health benefits.